Turkish President Erdogan’s regime used ‘state security’ as an excuse to cover up its smuggling of arms into Syria and persecute the journalists who revealed it, imprisoned Cumhuriyet newspaper editor-in-chief, Can Dundar, penned for The Guardian. Dundar has been in prison on charges of treason, espionage, and terrorist propaganda since the paper released footage proving Turkey’s involvement in smuggling weapons into Syria in 2014 over a month ago. “Turkey’s regime not only smuggled guns into Syria, it used ‘state security’ as an excuse to imprison the journalists who reported it,” Dundar wrote. Can Dundar and Erdem Gul, Cumhuriyet’s senior editor in Ankara, were arrested in late November. The case against them was launched after Turkish President Recep Tayyip Erdogan filed a criminal complaint accusing the journalists of revealing state secrets and aiding terrorists. In May, Cumhuriyet published several articles containing photos of what was claimed to be weapons smuggling by the Turkish National Intelligence Organization (MİT) into Syria in 2014. The trucks carrying the weapons were reportedly searched by police, according to photos and videos obtained by Cumhuriyet. “The truck was searched. Beneath the camouflage composed of medicines boxes, weapons and ammunition were found. The truck was held for a while, but following the intervention of government officials a safe passage into Syria was granted,” Dundar wrote. The paper reported back in May that the trucks were carrying six steel containers, holding 1,000 artillery shells, 50,000 machine gun rounds, 30,000 heavy machine gun rounds and 1,000 mortar shells for anti-Assad extremists in Syria. In the opinion piece, Dundar said that Erdogan “was in a fix” after Cumhuriyet’s report was published. “He couldn’t refute the story, so instead chose to censor the publication and threaten the journalist responsible, who was me,” Dundar wrote. The journalist recalled what Erdogan said after the publication of the story: “The person who wrote this story will pay a heavy price for it; I won’t let him go unpunished.” Erdogan added that the footage was a “state secret,” and that publishing it was an act of “espionage”. 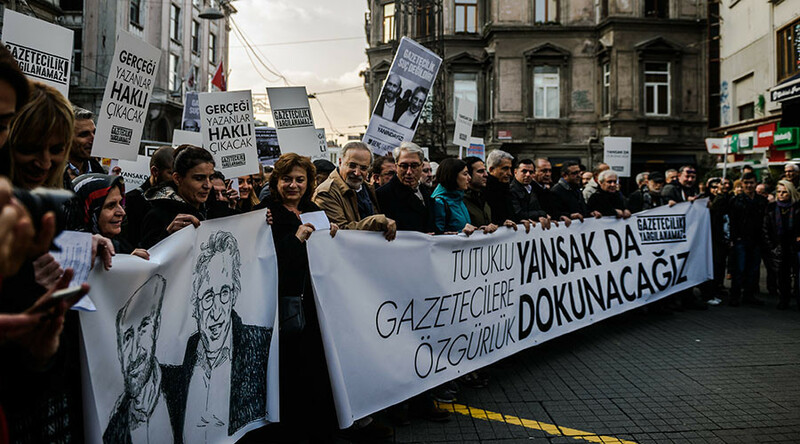 Following Dundar’s arrest, around 1,000 people came out to blame the government of attempting to cover up the weapons scandal by silencing the critics and the press. During a court appearance, Dundar said that, given the same circumstances, he would publish the report again.